After ten years in a legalistic church, Carolyn Wing Greenlee was empty, confused, and suicidal, but God sent True Believers to disciple His devastated child. The God they revealed to her was so astounding that she could not remember what they said, so she began taking notes during their conversations. 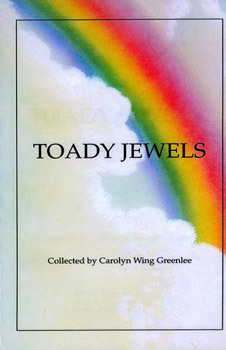 Toady Jewels is a collection of the comments which helped Carolyn into the delight of knowing the One True and Living God. It includes quotes on such subjects as God, The Christian Walk, Art and Beauty, The Flesh and the Devil, Obedience and Servanthood.